To say Ben is obsessed with peas would be an understatement. He loves peas as other people could only hope to love their spouse or perhaps their children. I mean, he has the word “peas” tattooed across his knuckles. On first meeting I thought it was a cool way of saying “peace” but then we started talking about food and I understood immediately...he very much meant peas. 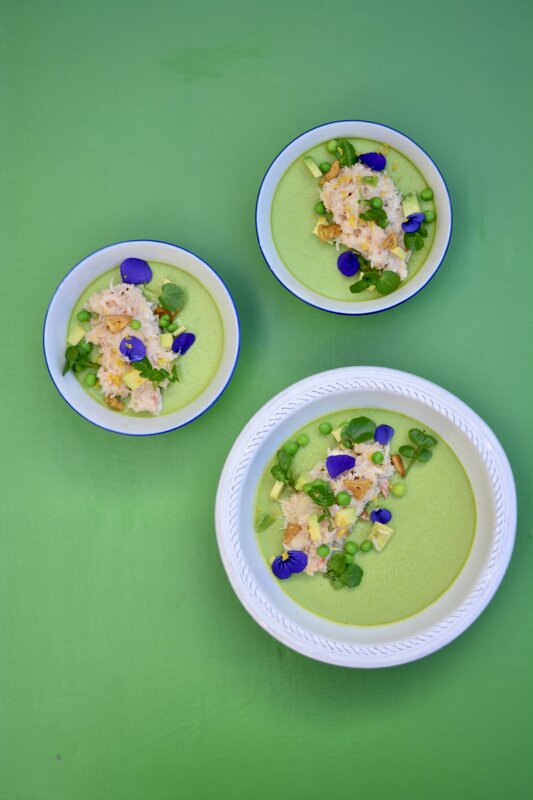 It seemed only fitting that today’s recipes was built around peas. I love the idea of creating recipes based on a single ingredient, using the pea as my muse and building from that. This dish is lovely and light, refreshing but rich. Dainty and delicate but also packed full of flavour. Because it’s one of my recipes, it’s really easy to make, but serving this at a dinner party never fails to impress which is a perk I admit. A pea pannacotta is a lovely thing. It sounds wrong, but that’s part of why I like it. Yes you could probably call this a mousse of sorts, I guess? But it’s made in the same way a pannacotta is and I like the alliteration pea panncotta produces. Whilst we are on that note, I think pannacottas are one of those things that people are really scared to make as they think they must be really difficult – but really they are very easy. They do require the use of gelatin which I think is what puts people off, but it’s really very easy to use. And the good news? Well, once you’ve mastered gelatin a whole world of new puddings opens up to your cooking world. Think jellies and…well, jellies is all I can think of at the moment but they are a pretty ace thing to be able to make so I suggest you hop to it. Anway back to this pea pannacotta. I believe the first time I encountered a pea pannacotta was on Come Dine With Me, please don’t judge. But someone made it, and everyone raved about it. Like seriously raved. So I got experimenting and this was the result after a few years of honing. 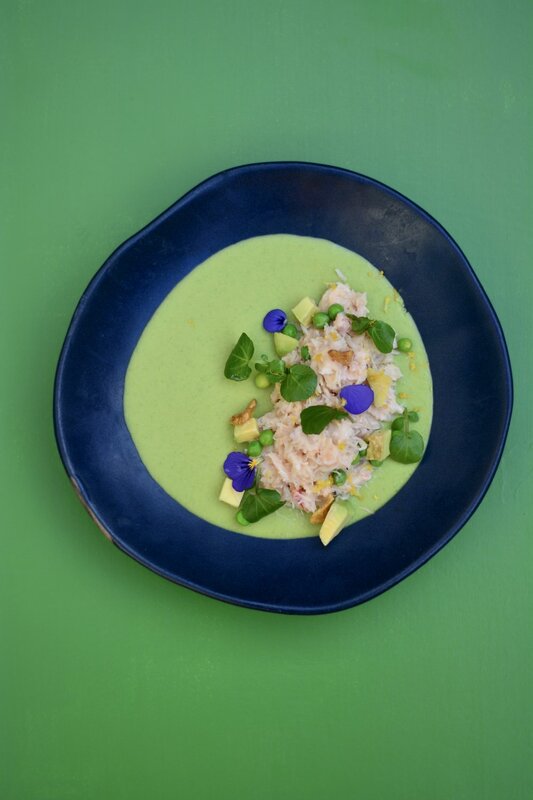 I love it with the crab and the avocado, it’s such a classic combination and for good reason. These look gorgeous set in round glasses or very shallow bowls like I’ve used. The pannacotta is rich, as they tend to be, so you don’t need a huge serving. Less is more I think, and it makes the plating up easier as it looks all neat and dainty. I recommend starting a good few hours before you want to eat - 4 to be on the safe side, or the night before if you prefer. Pour the chicken stock, peas, sugar, cream and salt into a saucepan and bring to the boil. Once boiling, boil until the peas are lovely and soft. This should take a few minutes or so. Measure the cream and you should have about 400 ml. Soak the gelatin in cold water until soft and then melt in a pan with a little of the pea cream. Once the gelatin has melted take it off the heat and whisk in the remaining cream. Pour into your bowls and pop into the fridge to set. To make the crab simply mix the crab with the creme fraiche, mayonnaise, lemon and salt and pepper. Taste and add a little more this and a little more that as needed. To assemble, once the pannacottas are set you simply top with the crab mixture and add the remaining garnishes.